Lemon flavoured cake with a lemon drizzle and sugar nibs. 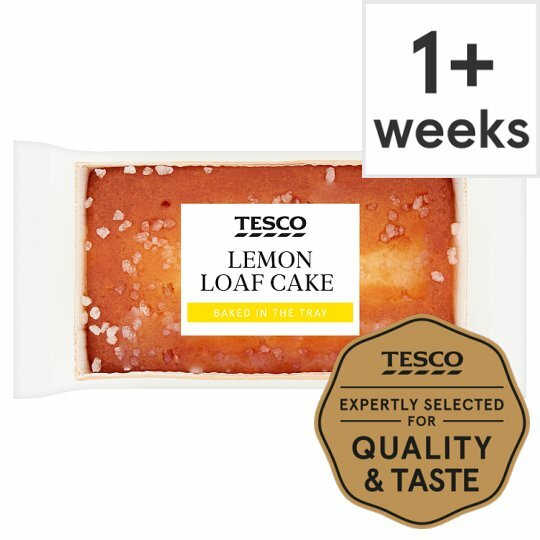 Baked in the tray Drizzled with lemon and sprinkled with sugar nibs for a zesty cake Our little cakes are individually baked in their own tray and transform any cake recipe into a fancy dessert, perfect for tea time or after dinner treat. Wheat Flour (Wheat Flour, Calcium Carbonate, Iron, Niacin, Thiamin), Sugar, Rapeseed Oil, Pasteurised Egg, Humectant (Glycerine), Pasteurised Egg White, Glucose Syrup, Butter (Milk), Lemon Juice (2%), Dried Skimmed Milk, Raising Agents (Disodium Diphosphate, Potassium Bicarbonate), Lemon Zest, Flavouring, Orange Cells, Emulsifier (Mono- and Di-Glycerides of Fatty Acids), Preservative (Potassium Sorbate), Salt, Concentrated Lemon Juice, Maize Starch, Gelling Agent (Pectin), Acidity Regulator (Sodium Hydroxide). Not suitable for home freezing., Store in a cool, dry place and once opened in an airtight container. Tip: for the perfect slice, unfold one end and peel back the sides. Use a serrated knife and slice with sawing action. Clean blade between slices.